What is your goal as a bodybuilder? Is it to simply gain some muscle and look a bit better than you are now? Is it to look a bit more impressive to get back at your ex? Or are your goals more lofty than that? Some people who choose to build up their bodies are looking to do more than just turn a few heads. For them the goal is to be as impressive as possible, to make a major impact that will seer itself into the thoughts and minds of the world at large. When you consider the men and women who enter professional bodybuilding competitions, you realize to what extent they’re pushing themselves and for what reason. Professionals want to be more than just an average bodybuilder who impresses a handful of individual but does little else. Consider a bodybuilding champion like Ronnie Coleman. He wanted to do more than just reach the Olympia stage, he wanted to dominate. In order for him to do that he had to bring something new to the table to ensure that his physique would be emblazoned into the minds of fans and judges alike. Coleman was a mass monster unlike any who came before him and for that reason is still considered to be one of the greatest of all time. It was his massive physique that was so memorable that it made everyone pause and pay attention. But there are still those who don’t make it up on a posing stage that can both be very influential and memorable. 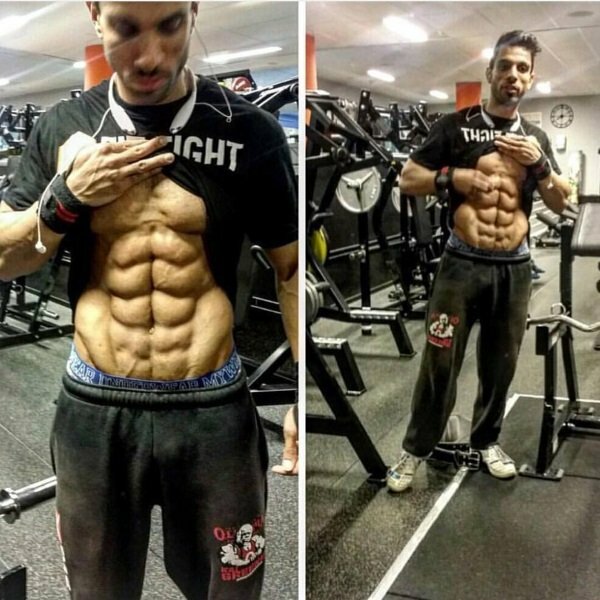 Check out this image before of a bodybuilder with an unusual amount of ab musculature. You may have heard of a six pack, maybe even seen an eight pack, but this guy brings something entirely new and crazy to the table. An actual ten pack! Are you impressed by this unusual display of muscle development?